Chipotle peppers in adobo are used throughout Mexico to spice up everythning from tacos to seafood. 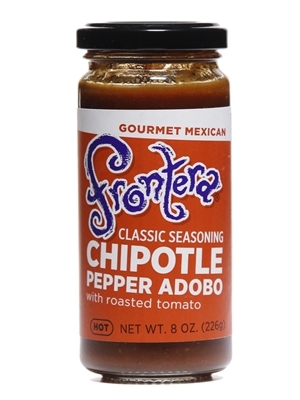 Frontera has blended them with roasted tomato and garlic adobo sauce for easy cooking. Ingredients: Chipotle pepper, filtered water, roasted tomato, onion, garlic, organic distilled vinegar, evaporated cane sugar, tomato paste, salt, oregano.